Injecting a little sunshine into your landscapes will give them a strong appeal, and the best way of achieving this is to lay cast shadows across a light surface. Nothing will give a more striking or fresh approach than doing this across a pristine snow scene. With winter upon us you will hopefully have opportunities for practising this effect before long. In this watercolour the sense of strong sunshine has been achieved by laying cast shadows across the foreground and over the left-hand part of the roof. For the shadows I used a mixture of cobalt blue and cadmium red, although very little of the latter was included as it is a powerful colour. This produces a lovely, fresh shadow and is not as dull or overpowering as say burnt umber mixed with the cobalt blue. French ultramarine is also a superb colour if you wish to substitute it for the cobalt blue. Note also the warm colours employed on the house and trees – this takes away the utter coldness of a snowy landscape. Aim to have white highlights on the snow, but not an overall whiteness. On the left-hand trees I deliberately applied white gouache with a painting knife. I don’t normally do this, but I wanted to show a variety of techniques in my Winter Landscapes in Watercolour book, where this scene appears. Don’t forget to watch out for that snow – it rarely seems to stay long these days so make the most of it whilst it’s still around, and preferably before all those tobogganers have churned it all up! 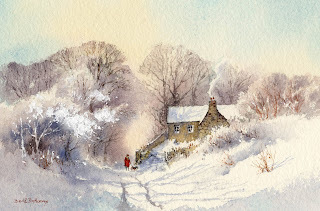 This entry was posted in atmosphere, David Bellamy, Painting snow, Winter landscapes in watercolour, Winter trees in watercolor and tagged #saunderswaterford, #stcuthbertsmill, Watercolour techniques by David Bellamy. Bookmark the permalink. I lapped up your paintings at the Ardent gallery, just over a week ago, especially your little gem in the window! I have since then acquired cards – so glad you are selling some! Happy winter painting to you! I love the touch of red (person’s jacket) in the painting too! Thanks for all the watercolor paintings and techniques!